We’ll keep this short. Almost choked on my lunch today while catching up with the best magazine on the planet, The Economist. … The victim, G[…], was a member of the Hells Angels, a biker gang that has a difficult relationship with the law (and with apostrophes)…. mm278a: [Repost] Don’t look back: Something may be gaining on you. Found a video that I had seen, along with zillions of others, some time ago, but it gained fresh context when connected to a recent briefing in the best magazine on the planet, The Economist. Many of the above links refer wholly or in part to UAVs, unmanned aerial vehicles. So one might imagine that MUDGE is somewhat taken with the concept, and one would be correct. But, this is not solely the byproduct of some feverish boyhood-hatched hobbyist daydreaming; this is mainstream, folks. The first link above referenced a fascinating story on UAVs at war that appeared in the Los Angeles Times. Mentioned during the Wright Brothers post that it had been my intention to use Orville and Wilbur as the jumping off point (as it were) for a large scale story we’ve been accumulating regarding this intriguing development — remote controlled aircraft at war. But, that post took off in another direction (aiw), and we hangared the UAV for another day. Then, casting around this evening for tonight’s topic (last night’s wrote itself — one gets spoiled), I finally arrived at the best magazine on the planet, The Economist whose print edition I confess that I’ve fallen a bit behind in reading. And there, in their Technology quarterly, a couple of intriguing aircraft stories, including a well written (of course) analysis of the most common UAV, Predator. 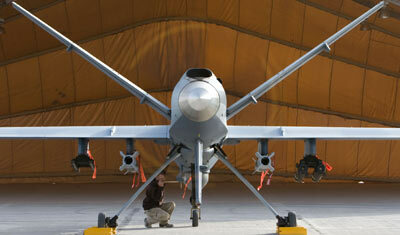 Aviation: Unmanned aerial vehicles are a vital tool of modern warfare. Once-harmless drones are now deadly attack aircraft. Where did the technology come from, and where is it going? DUSK falls over Baghdad and Kabul, and the Predators take their places in the skies overhead, ready for action. Western soldiers prefer to fight in the dark, when their night-vision gear gives them the advantage over insurgents. They know that with drone aircraft scanning the ground, with unblinking eyes able to see by day or night and radars that can see through cloud, they “own the night”. For the Predators’ pilots, however, it is still bright daylight. Sitting in cramped metal containers in bases across America, they fly their machines by remote control from thousands of miles away, via satellite links. The video from the drones is gathered in a makeshift operations centre in the Nevada desert and distributed to leaders in the Pentagon and commanders on the ground. In the Predator operations centre, one screen monitors the weather around the Arabian Sea (Predators do not like rain or high winds), another shows the location of each aircraft on a map, and a third projects a mosaic of video images from each plane. One image shows a house under close observation in a palm grove in Iraq; another shows a road being scanned for hidden bombs. A laptop computer system known as Rover allows troops on the ground to watch the footage, and will soon let them mark out targets. After a useful history of the development of UAVs that begins, of course, in Britain in the 1930s (much inventive military technology either originated or was perfected in England, including that oh-so-American entity the modern aircraft carrier, whose offset deck and steam catapults are English imports), we arrive at Israel in the 1980s. Ultimately it was Israel, not America, that revived the use of drones in warfare. It had seen at first hand in the 1973 Arab-Israeli war the damage that modern air defences can cause. In the 1982 Lebanon war, the clever use of small Israeli-built UAVs (incorporating technology developed in America’s disappointing programmes) helped win a startling air campaign in which Syria’s anti-aircraft batteries in the Bekaa valley were destroyed and up to 100 Syrian jets shot down against no losses for Israel. In carefully choreographed moves, drones were used to spy on the Syrian defences, fool their radars and gather the electronic intelligence needed to destroy them. Unlike America, which sought to operate large UAVs at long distances through hostile air space, Israel’s drones operated from its own defended territory, and real-time video was transmitted through short line-of-sight data links. Israeli UAV technology became all the rage in the Pentagon, especially after the American navy lost three aircraft over Lebanon in 1983. Predator is in fact derived from a design devised by a former Israel Aircraft Industries engineer. Before providing you the link, need to share this wonderful diagram. As The Economist points out UAV technology is evolving rapidly beyond primitive (in technology terms) Predator, which is tricky to fly, greatly prefers good weather, and gulps down huge swaths of commercial satellite bandwidth. The Wright Brothers started flying kites; now pilots control their high flyers with invisible strings, or just with strings of program code. What an awesome circle this makes, in just over 100 years. But, what are the flyguys going to do with all that surplus “right stuff” if callow 20 year olds in Nevada perched in front of consoles are doing all the flying and war-winning?